I have the fortune of coming across many amazing people in my life. These connections remind me that health, as we all know, come from many avenues and only creates a complete model of health from the combination thereof. On a recent occasion I have had the pleasure of working with an amazing woman who has inspired me and offered me a perspective on health that I forget about and yet it is a part of me and most likely you. I wanted to share her perspective and ideas as a means of adding to the many ways in which health comes to us. As beings in constant communion with the world, all we need is to let our experience rush in and fill us up – to live richly in all the details and textures. The innate joy in the fullness of your presence is there, waiting for you to feel it. When you live in touch with the deep wellspring of lifeforce pulsing within and align with your soul purpose, you glow from the inside out. This is what it means to live an inspired life. When what you do aligns with what you want and where you’re going, good things happen, as if the universe opens up to you. But all too often, I find people stuck in a fog of unknowing, often with ideas that need a place to land – or a plan for success. “I just know,” I would reply with little explanation, a shrug and a smile. The clarity was a full-bodied knowing – and a sense of the pull coming from where I was headed, bodying forth into a future that was calling me into it – even if I didn’t have a mental understanding of what that notion was. Any artist will tell you that the impetus for creation comes from an ambiguous place and unfolds before them in the process – but it’s about trusting that first core gut intuition that creates space for great art. But you have to be listening and ready for the messages. Since 2009, I’ve been keeping a manifest journal – starting with a black hardcover book with blank pages – and pouring into it all my thoughts, visions, dreams, fragments from the day, inspirations, to-do lists and mini-collages. This process has its own sort of magic that lends itself to the personal process of transformation – and the planting bed for grounding ideas in the world. In this way, the whole book (or set of books) becomes one continuous manifesting exercise. Whenever I need to create something, to shift energy or get out of my headspace I always turn to the stack of magazines until I have collected enough images to make play in the pages of my journal. I’m always amazed at what happens just by giving myself time to listen to that inner voice. 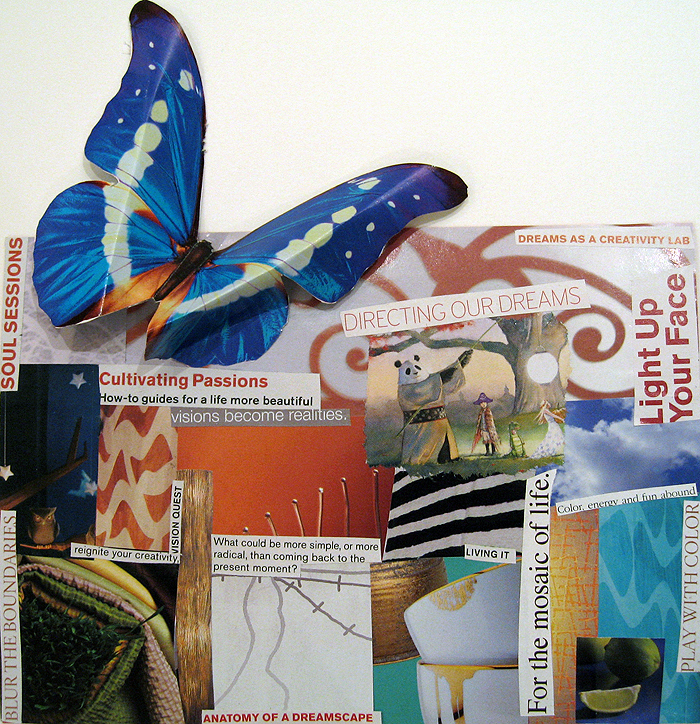 When I look back over the seemingly random collage of text and image fragments, I read it like a soul map with a regained sense of affirmation and clarity – and most often new insights that create a positive shift towards what I want or where I want to be. Your best life ever is waiting for you to step into it, to be filled with it and to dare to be radically alive. What are you waiting for? I put together The Inspiration Book to jump-start the process. You can download it here. If you have read any of the articles in my blog, chances are you know about how I feel about carbohydrates – especially simple ones. By ‘simple’ I mean those items that have been processed to create a product such as scones, pasta, breads, cookies, cakes, and more. Let’s face it, these aforementioned foods are yummy and addictive! I know as I go through periods of time when I crave them just like the rest of America. Usually I am pretty good at avoiding them on any regular basis but occasionally I slip. This last weekend was a perfect example. I was visiting my mother in California for a long weekend. She has been recovering from Ovarian Cancer and is doing amazingly well for an 89 year old woman – has regained 23 pounds, is back to all her social events, going to the gym and even walking her ‘old 2 mile route’ that she did for years. Yes, she is a trooper! While in California, at the 1 mile marker of her ‘route’ lays a small town called Sierra Madre. On the main drag is a coffee shop called Bean Town. Well, they have the best cranberry scones ever. Of course a visit to see mom always involves a day of going to Bean Town but this time it got out of hand. We ended up going there all three mornings in a row! Now I did vary one day and have their cinnamon coffee cake instead but… well you get the picture. By starting each day out this way, lead to wanting more carbohydrates throughout the day. Consequently I ended up eating bread as well as crackers rather than just the usual huge salads. I even had a cookie one day! This is a lot of these types of food in a very short period of time for my body. Normally having one of those things every week or two wouldn’t really make a difference but the quantity and frequency played havoc on me and it got me to thinking how this has such a huge impact on peoples’ health. First, simple processed carbohydrates are acid producing. By this I mean that when they are broken down in the body, they create ash that is of an acid nature. Not only is all disease found in an acid environment but so is inflammation. Our bodies are always healthier in an alkaline environment and yet our tendency is to eat foods that are acid producing including all the refined foods I’ve already mentioned. Now the foods themselves do not cause the inflammation but rather it is our body’s response to them when they are broken down. Foods that have a high glycemic index and consequently convert into sugar quickly alter our body’s normal hormone balance. This imbalance can result in an overproduction of such things as C-reactive protein (CRP); a protein designed to be produced during acute stages of trauma, infection and inflammation. Although we need CRP produced in acute phases we certainly do not need it to be continually produced. Just this one protein has a huge impact on the health of our cardiovascular system. And this is just to name one of the many negative results of eating refined foods. The picture gets even more involved as those same yummy foods lead to an increase in weight. When we eat foods that break down quickly into sugar our body MUST burn it off rapidly or it is converted into fat, especially belly fat. This belly fat in turn causes an increase in the production of CRP by the liver and the inflammatory response is again increased. As you can see it is a vicious cycle. Unfortunately as our society gets more and more addicted to these foods our bodies become sicker. We begin to become accustom to our joints hurting. We think it is normal to carry around an extra 5 or 10 or 50 pounds of body fat. We tend to accept all of this as a normal process of aging. Well for me, I don’t buy it! When I am eating a healthy, high alkaline diet and staying away from process foods most of the time, I feel SO different. I feel energetic and happier. My joints don’t ache. I don’t have an issue with excess weight because I am utilizing the foods I eat so they aren’t storing as fat in my body. Overall I am more vitalized. You shouldn’t buy it either! I hope you will consider altering your diet to see how all this affects you. It won’t happen overnight if you’ve been eating poorly – even just part of the time – but it will change. I encourage you to give it a good 3 or 4 months and keep a journal of how it has created positive changes in your life. Eat a minimum of 70% of your diet from the alkaline side of the food chart. For a copy of the chart, download this pdf. Eat at least 80% of the time healthy; saving the ‘not so good’ foods for special occasions rather than daily. Make a journal or chart of not only what you eat now but how you feel so you can track the changes. This is a great motivator when you are falling back into those bad habits. Even if you think you eat well, you might be surprised just how often you ‘cheat’ and eat some of those processed foods more regularly than you ever thought. Last, be gentle with yourself. It is not an easy thing to change addictive behaviors and even easier to allow them back in. When you fall off the health wagon, note it but don’t beat yourself up about it. Simply get back on the right track and move forward. I hope this has motivated you to make choices and changes. You deserve it! I received some interesting feedback from my article Agave-Health Food Fraud. Some people were defensive or angry, others concerned or happy to be informed. I stated that agave syrup was a chemically processed starch similar to the way high fructose corn syrup (HFCS) is made. 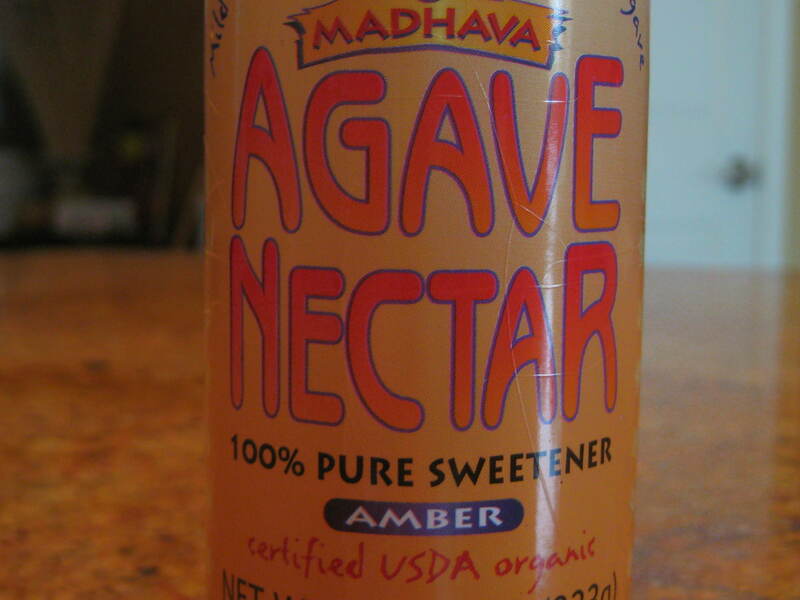 A number of people reported that Madhava’s agave syrup was not chemically processed. Perhaps not. The real issue is fructose, and what happens when it enters the body. There continues to be more studies coming out implicating HFCS in heart disease, liver disease, diabetes and obesity. A recent human study compared two groups of people, one consuming glucose, the other fructose. While both groups gained 3 pounds of weight, the fructose group also had elevated LDL cholesterol and triglycerides and their extra weight was more abdominal fat than the glucose group. When glucose is absorbed, it goes into the bloodstream, raising blood sugar and insulin to bring glucose to the cells for energy. Excess glucose is converted to fat. When fructose is absorbed, it goes directly to the liver and does not raise blood sugar levels. It is touted as a low glycemic sweetener for this reason. In the liver, fructose is converted to triglycerides for storage as fat through a process called glycosolation. This causes glycation, or sugar damage to the liver and other tissues. Glycation and oxidation are the two main ways that our bodies age. Fructose is processed in the liver similar to the way alcohol is processed, creating some of the same side effects of chronic alcohol use, right down to the beer belly and can cause non-alcoholic fatty liver disease. Fructose also raises uric acid levels, a cause of gout and chronic inflammation. It also leads to weight gain, abdominal obesity, decreased HDL, increased LDL, and elevated triglycerides. It is similar to drinking alcohol without the buzz. This creates insulin resistance first in the liver, then throughout the body. Insulin resistance causes obesity, diabetes, heart disease, Alzheimers and cancer. While there are more and more studies on the negative effects of HFCS, there are no studies that I know of on agave syrup. However, we do know the potential damage that fructose can cause. HFCS is 45-55% fructose. Agave syrup is 56-97% fructose, having almost twice the fructose as HFCS. Nature may have made fructose fattening, rather than energy producing for good reason. In temperate climates, almost all the fructose in the form of fruits ripen toward the end of the summer and fall, so that mammals that hibernate and humans and mammals that don’t, can increase their fat reserves to survive the winter. – Agave syrup, or nectar, is not a health food. – It is not a safe sweetener. – In small amounts occasionally, not daily, will likely do little harm. marketed that agave syrup is low glycemic, “gentle” or safe.